The Vigor3900 Central site VPN gateway is an enterprise-level VPN concentrator providing security and cost savings benefits for business through flexible, reliable, and high-performance LAN-to-LAN and remote-access solutions. 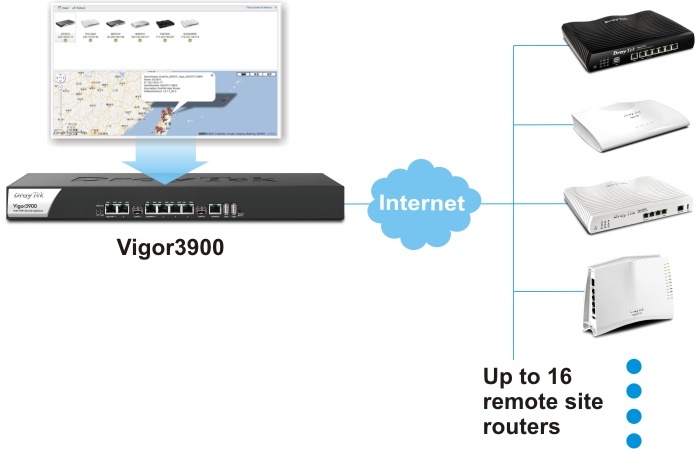 Vigor3900 not only offers hundreds of VPN tunnels compatible with multiple VPN protocols, such as PPTP/L2TP/IPsec/L2TP over IPSec to satisfy LAN-to-LAN and remote secure communication needs, but also provide SSL VPN* connectivity to better facilitate remote users to access corporate database. With Gigabit Ethernet LAN/WAN and active fiber interfaces, Vigor3900 offers unprecedented data transmission speed for mission-critical applications and do load-balancing for WAN and VPN failover to enhance performance, redundancy and reliability of business operation. 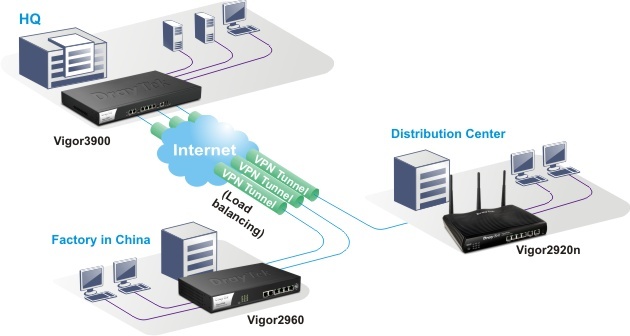 The advance Load Balance and Failover features of Vigor3900 can balance traffic from your LAN to multiple internet connections (WANs). The easy-to-use web user interface allows administrator to configure comprehensive network settings in minutes to optimize bandwidth usage and establish a reliable network based on actual operation needs. Traffics from the LAN are shared out on a round robin basis across the available WANs. Vigor3900 can monitor each WAN connection, using an IP address you provide, and if Vigor3900 monitors fails, a failover configuration will take place and typically just feeds all traffic down the other connection(s). Especially, the pooling configuration concept allows administrator to select desire WAN ports as load-balancing pools with weight setting capability / failover pools and modify policy if necessary and then configure each WAN port with detail network information that helps administrator build a substantial network to facilitate daily operation with versatility, scalability and reliability. The DoS/DDoS prevention and URL/Web content filter strengthen the security outside and inside the network. They can block the HTTPS web access well with the integration of the object-based firewall setting. The enterprise-level CSM (Content Security Management) enables users to control and manage IM (Instant Messenger) and P2P (Peer-to-Peer) applications more efficiently. The CSM hence prevents inappropriate content from distracting employees and impeding productivity. Furthermore, the CSM can keep office networks threat-free and available. 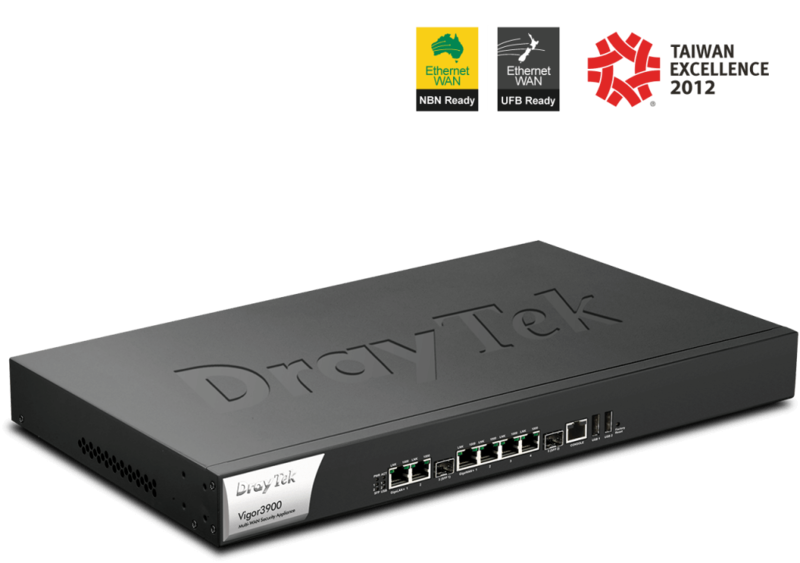 The Vigor3900 supports authentication by the PPPoE server with wire-speed Internet Access capability to LAN users (e.g. employees). This feature saves a lot of time compared with IP-bind-MAC method to benefits the network administrators. Quality of Service (QoS) function of Vigor3900 implemented Ingress and Egress Filter Rules monitoring LAN/WAN incoming and outgoing data packets. These rules can prevent unwanted data packets from outside to access corporate network as well as distribute corporate data to non-recognizable destinations. The subscribed bandwidth wouldn’t be wasted on useless data packet exchange activities and may reduce the risk of damage corporate network or confidential information leakage. Moreover, Vigor3900 has eight classes of priority level settings which allow administrator to better prioritize the importance of bandwidth usage in detail. Administrator can use bandwidth limitation to grant different bandwidth to different workgroups based on their main job function which can be viewed as macro view of bandwidth allocation. In the micro view, administrator can define different sessions through session limitation to individual client device based on IP address in each workgroup. For instance, Sales Dept. in total might need the larger bandwidth than others for better serving customers. However, sales assistants could be granted minimum sessions because they don’t need to interact with customers directly to facilitate their jobs.